Automobiles E. Bugatti was a French car manufacturer founded in 1909 in Molsheim, Alsace, as a manufacturer of high-performance automobiles by Italian-born Ettore Bugatti. Bugattis were well known for the beauty of their designs (Ettore Bugatti was from a family of artists and considered himself to be both an artist and constructor) and for the large number of races that they have won. The death of Ettore Bugatti in 1947 proved to be the end for the marque, and the death of his son Jean in 1939 ensured there wasn’t a successor to lead the factory. No more than about 8000 cars were made. The company struggled financially, and released one last model in the 1950s, before eventually being purchased for its airplane parts business in the 1960s. Today the name is owned by Volkswagen Group, who have revived it as a builder of limited production exclusive sports cars. 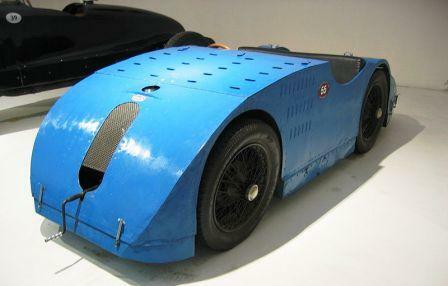 Bugatti Type 32, commonly called the Tank de Tours, was a streamlined racing car built in 1923. Four examples were made, each with a 2.0 L (1991 cc/121 in³) straight-8 engine based on that in the Type 30. “The Tank” finished third in the ACF Grand Prix that year. This was the first Bugatti to be fitted with roller-bearing big ends in order to improve the bottom-end reliability (Bugatti was rather later than most manufacturers in the incorporation of a fully pressurised oil system, preferring a splash “spit and hope” delivery method).